The Chisholm Kid, Lone Fighter for Justice for All pays homage to the many black cowboys who drove longhorns up the Chisholm Trail out of Texas and across Indian Territory to the railroad trailheads in Kansas during the years following the Civil War. Once freedom arrived, many freedmen found work as cowboys and applied their skills and experiences learned when they were slaves to earning a living on the back of a horse. While no definitive numbers exist, it’s estimated that at least 25 percent of all cowboys on the trail during this period were African American. The Chisholm Kid exhibition features panels from the trailblazing color comic strip of the same name that ran in the early 1950s in the Pittsburgh Courier, one of the nation’s pre-eminent African American newspapers. The Chisholm Kid is both historically and culturally significant due to the strip’s hero, the Chisholm Kid, being presented as a positive force for good at a time when so many images of African Americans in all forms of popular culture reflected negative stereotypes. 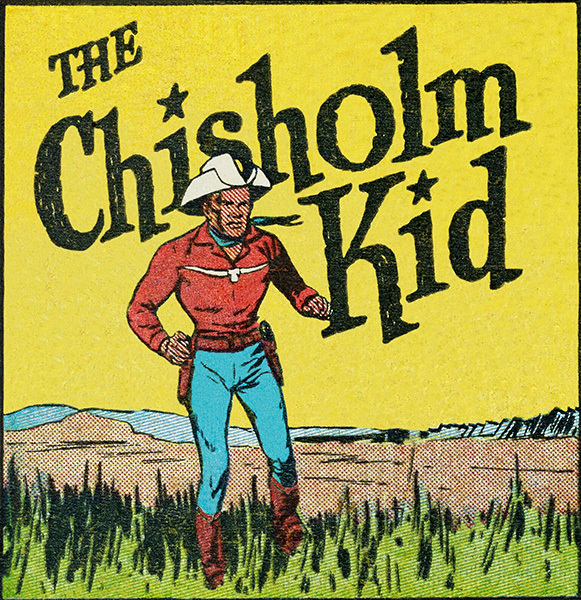 These positive depictions of a black hero positioned The Chisholm Kid as an equal to his white Western comic strip contemporaries, Hopalong Cassidy and The Lone Ranger. For African American audiences of the day, The Chisholm Kid was an American hero, fully empowered with civil rights, the very rights denied those African Americans reading the strip. In many ways The Chisholm Kid was a harbinger for the civil rights movement, especially considering that the strip began its run several years before the seminal 1954 Supreme Court case Brown v. Board of Education. Regrettably, by the time that African Americans across the nation were fully demanding the rights and equality promised all Americans in the 14th and 15th Amendments to the U.S. Constitution, The Chisholm Kid as a comic strip had ended its run, leaving the Kid unable to continue his fearless fight for justice for all. Despite no longer being on the trail, The Chisholm Kid’s spirit of justice for all was present in the civil rights campaigns of the 1960s, and fully personified in Dr. Martin Luther King’s dream of being judged by the content of one’s character, not the color of one’s skin. The Chisholm Kid: Lone Fighter for Justice for All is curated by the Museum of UnCut Funk and includes comic strips from the museum’s archives, the estate of the publisher, and the University of Michigan Special Collections Library.